In order to gain the ability to meet all the demands of a composition, musicians must have a vast repertoire of movements that give them the freedom to use their bodies with maximum efficiency. In our time together, we will focus on the cues and information provided by our body rather than by our intellect or auditory sense. We will explore options in movement as a means of enhancing freedom and avoiding reliance on one, habitual way of moving. Most humans accept the ways that they move as if they are a part of their genetic makeup. In reality, they learned to move by trial and error, and their nervous system is wired according to their experiences. Unless they are challenged to question this wiring and to explore new possibilities of movement, they limit their range of expression. It is useful to be challenged to explore new ways of moving while playing, and to correlate them with minute differences in the quality of sound. Through my experience, I have found that when we discover the power of becoming aware of small differences in our movement, it is not only our sound that changes, but also our coordination, overall technical proficiency, imagination and freedom of expression. The benefits of body awareness also help in the prevention of injury, and in healing after a disabling injury. Uri Vardi has performed as a recitalist, soloist, and chamber player across the United States, Europe, South America, Asia, and his native Israel. Born in Szeged, Hungary, Vardi grew up on kibbutz Kfar Hahoresh, Israel. He studied at the Rubin Academy in Tel Aviv, was an Artist Diploma student at Indiana University, and earned his Master’s degree from Yale University. His teachers have included Janos Starker, Aldo Parisot, Eva Janzer, and Uzi Wiesel. Vardi has recorded and toured widely with the Israel Chamber Orchestra and was a founding member of the Sol-La-Re String Quartet. He has served as Assistant Principal Cellist of the Israel Chamber Orchestra and Principal Cellist of the Israel Sinfonietta. 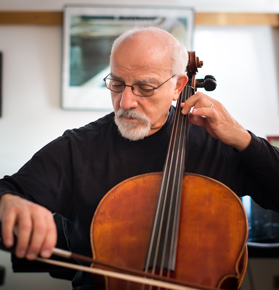 In 1990, following an extensive teaching and performing career in Israel, Vardi was appointed professor of cello at the University of Wisconsin-Madison. In addition to his work at Wisconsin, Vardi has taught and conducted master classes at numerous music schools, including: Juilliard, Eastman School, New England Conservatory, Indiana University, Yale University, Oberlin College, Cleveland Institute of Music, University of Iowa, Ohio State University, Geneva Conservatory (Switzerland), Paris Conservatory (France), Tunghai University (Taiwan), Bartok Conservatory (Budapest, Hungary) , and the Jerusalem Music Center (Israel). The St. Petersburg School-Music for Cello. Vardi researched, performed and recorded (with pianist Uriel Tsachor), compositions written by Russian-Jewish composers, many of which had never been previously recorded. In 1977 Beth Hatfutzot (the Diaspora Museum in Tel Aviv) released the recording on a CD, which was favorably reviewed by the Jerusalem Post. “Fusions”, A concert of Jewish Music and Arab Art Music. “Fusions”, sponsored by the University of Wisconsin-Madison and the Consulate General of Israel in NYC, was a chamber music project of Jewish music and Arabic art music, culminating in a commissioned trio for oud, cello and piano. In this project, Vardi collaborated with oud artist Taiseer Elias and pianist/composer Menachem Wiesenberg. The project toured Israel and the U.S and was positively reviewed by major newspapers such as the Washington Post and the Boston Globe. This successful chamber music project was the inspiration for the commission of a full orchestral composition. “Forty Steps”, a Double Concerto for Cello, Oud and Symphony Orchestra, written for Taiseer Elias and Uri Vardi. Commissioned by the University of Wisconsin- Madison chancellor‘s office. Composed in 2007 by Joel Hoffman, it was premiered as part of the Madison Symphony Orchestra’s 2007-2008 Concert Series in March 2008. National Summer Cello Institute, in conjunction with the Feldenkrais for Musicians Workshop. The National Summer Cello Institute is a unique program exploring the relationship between body awareness, creativity in performing and teaching, and prevention of music related injuries. This Institute is geared towards professional and graduate cellists and other performing musicians. It has been co-sponsored by The College Music Society and the UW-Madison School of Music, since 2010. Internationally renowned Cello Teachers (such as Timothy Eddy, Laurence Lesser, Steven Doane, Ralph Kirshbaum and Richard Aaron) have been involved in instruction and in conducting Masterclasses. Vardi’s students have been successful as soloists, chamber players, faculty members of major music schools (such as Oberlin College and Peabody) and members of major orchestras such as The New York Metropolitan Opera (Associate principal), the Israel Philharmonic Orchestra (Principal), the Boston Symphony Orchestra, the Simon Bolivar Orchestra in Caracas, Venezuela (Principal), and the Seattle Symphony Orchestra. In his teaching, Vardi puts great emphasis on the relationship between movement and sound. In order to further his understanding of this approach, Vardi has specialized in the Feldenkrais Method®, for which he received the 1999 UW-Madison Arts Institute Creative Arts Award. He completed a Feldenkrais Practitioners Training and was certified by the Feldenkrais Guild of North America® and by the International Feldenkrais Federation as a Feldenkrais practitioner in 2003. In the last decade, Vardi has created a new course at UW-Madison: “Feldenkrais for Musicians”. In 2012, Vardi was awarded the UW Art Institute Emily Mead Baldwin Award to Create a Program for Somatic Education in the Performing Arts at UW-Madison. Watch these instructional videos of Uri working with musicians.